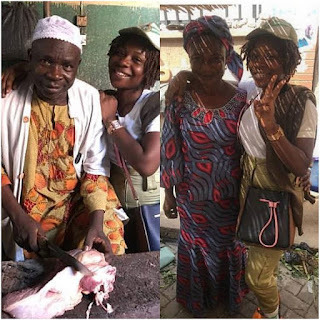 Nigerian Corper, Kashishelewa Poses With Her Parent Who Her Meat Vendors On Gram. Photos - NAIRAFAME | Best Entertainment Platform. "I Am the Proud Daughter of A Meat Butcher, On No Account should you ever hide your parents because you want to be with someone or Because of Social media, before this people your parents have always been there for you, be proud of who your parents are" - Nigerian Youth Corper Kashishelewa says as she post photos of Her parents who her meat Vendors on IG!! !